Osteoporosis is a common disease that affects women throughout and beyond middle age. The condition progresses throughout four stages, during which bones break down quicker than new bone forms. Learn more about the four stages of osteoporosis as well as how to protect yourself from this degenerative disease below. The early stages of osteoporosis can begin at around age 30, but it often does not cause noticeable symptoms or problems. This is the point at which old bone may begin to be broken down at the same rate that new bone is made. As long as this rate stays constant, the bones will not weaken significantly. Like the first stage, the second stage of osteoporosis is also fairly hard to notice. It mostly occurs after the age of 35, although can begin later in life. In this stage, old bone is broken down slightly faster than new bone is formed. Although this faster rate of resorption can be recognized on bone density tests, bones are not significantly more likely to fracture because their strength has not deteriorated. Because of this, few tests are performed, and few cases are detected. The first time that osteoporosis becomes obvious and noticeable is at the third stage, referred to as osteopenia, which usually affects people aged 45 to 55 years old. It is as this point that bones weaken to the point that they can begin to break under stress that would normally not affect healthy, strong bones. Most often, osteopenia will be diagnosed during this stage. The majority of cases are not diagnosed earlier, because there are no indications of a problem until bones begin to break easily. Once the third stage is reached, tests reveal low bone mineral density characteristic of osteoporosis. There are fewer distinct differences between stage 3 and stage 4 osteoporosis than between some of the early stages of osteoporosis, but in general, the fourth stage is when bones begin to fracture and cause significant distress. 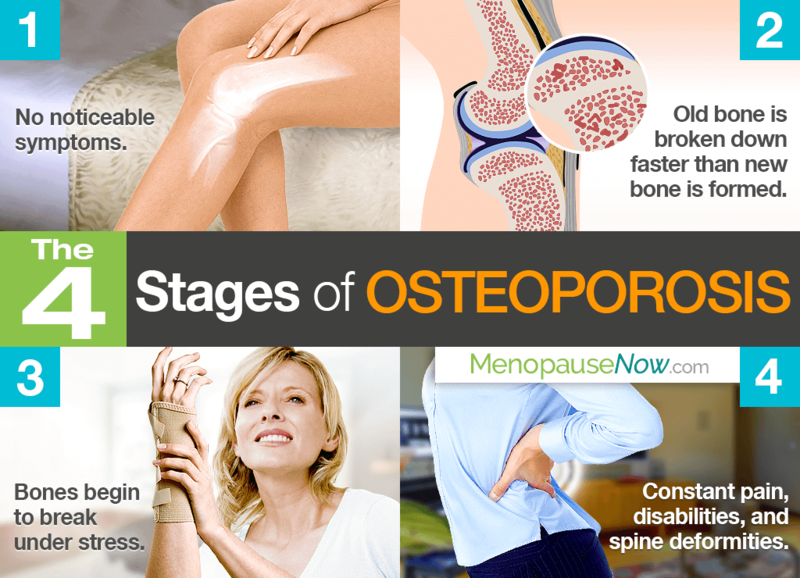 Some symptoms of stage 4 osteoporosis are constant pain from small stress fractures, disabilities, and spinal deformities. Since the spine carries so much weight, it commonly experiences fractures and a form of slumping. The good news is that it is becoming less common for people to pass all the way through to stage 4 osteoporosis due to medical advancements in treatment to prevent breaks and brittle bones. Nevertheless, knowing the facts about the early stages of osteoporosis might help you to catch the condition earlier or learn how to prevent it throughout menopause. Learn more about natural and effective osteoporosis treatments during menopause by clicking on the previous link. Your bone health begins and ends with you. Women who are in their early to mid 30s and premenopausal can develop osteoporosis as a result of a hormonal imbalance or other health conditions.